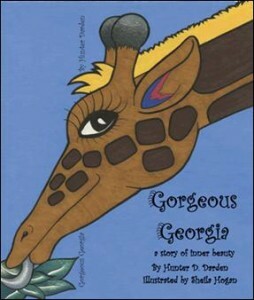 Gorgeous Georgia is a giraffe and...well...as you can see...she's just plain gorgeous! She knows it and feels inclined to tell everyone so. She brags about her lovely, long neck, beautiful chestnut brown spots, graceful, lengthy legs and her long, blue tongue. The other animals find her objectionable. Georgia has the misconception of thinking that by telling all the other animals in the forest about her beauty, they will naturally want to know her. However, they want to stay away from her. Georgia is left feeling lonely. As a defense mechanism, she finds herself making fun of the other animals. As her morning ritual, Georgia stares at her gorgeous reflection in the lake One fateful day, she slips and scrapes her neck on a branch that will leave an inevitable scar down the length of her lovely neck. The other animals feel no desire to help her. Until...Sabra, the wise, old lioness, tells them the sad story of Georgia's childhood that was filled with loneliness. Her parents were taken to the zoo and she was left on her own. The animals begin to feel compassion for Georgia and understand her need to feel liked. They rescue her from the lake. They start noticing and enjoying her good traits. IF YOU WOULD LIKE AN E-BOOK COPY OF THIS BOOK, CLICK HERE.